The Genie Runabout with Jib (GR™-26J) is a versatile, two-person machine well suited for increasing productivity in congested industrial areas, corridors and hallways. The rotating jib provides "up-and-over" maximum clearance of 21 ft 10.5 in (6.70 m). Genie Runabout with jib with 140º working range. Genie Runabout have two-person occupancy indoor and outdoor. Genie Runabout is hydraulic turntable rotation. Genie Runabout driveable when fully elevated in congested areas. Proportional lift and drive controls. 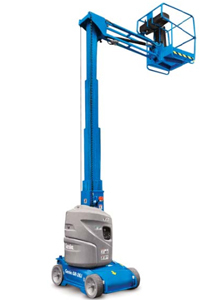 Genie lifts is variable speed direct electric drive motor. 31 inch inside turning radius. Maintenance free rigid steel hydraulic mast and steel platform. Class leading light weight of 6,250 lbs (2,835 kg). * Gradeability applies to driving on slopes. See operator's manual for details regarding slope ratings. ** Imperial measurements of working height add 6 ft to platform height. The metric equivalent adds 2 m to platform height. *** Values apply to non-working reach.